The music takes me away from my writing chair here and brings me to where. Any where I want to go. On this morning, I’d like to go back to the weekend, where my son-in-law sets an individual lava cake ramekin in front of me, proud of his accomplishment, beaming in my praise. Sons-in-law have it tough, I muse now as a chilly May breeze blows through my window, bird song following with twirling high notes of friendly greetings. I lean back in my oak chair, my rear aided by a turquoise pillow at the seat, a flowered thicker pillow at my back. I may be here a long time as I tap out my musings, wild things scampering out of my morning brain. Where was I? Oh, yes, sons-in-law. The music wafting from my computer – the San Francisco classical station I listen to all day – is Dvorak’s Bagatelle #5 Op.47. The notes weave in and out like the thoughts in my head as my hot green tea cools. Sons-in-law are rarely good enough for our daughters. They have an impossible job – loving our progeny with absolute perfection. My son-in-law may not be perfect, but he came close this past weekend. He handed me a bouquet of peonies as he grilled fish tacos for the entire family, including their three children, and then finished off the meal with his homemade lava cakes. 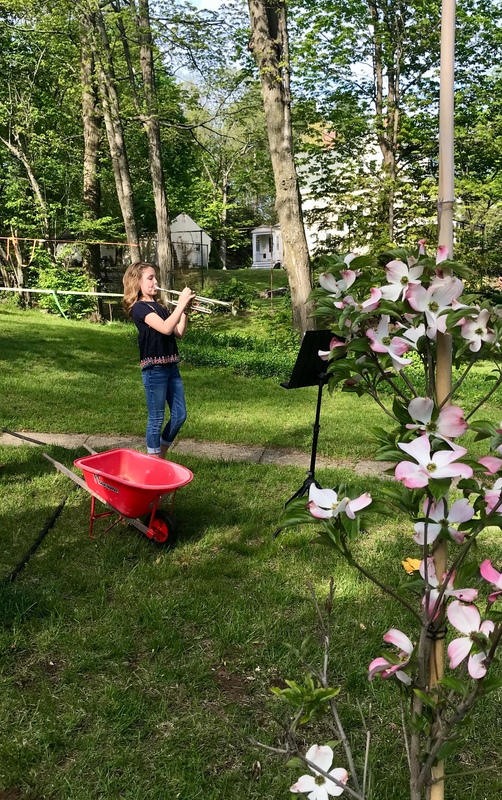 But first, we all watched as he surprised our daughter- his wife – with a new dogwood tree, digging up a hole while the kids oohed and aahed, asking his wife to name the tree – Delilah the Dogwood she proclaimed immediately – and then playing a trumpet dedication with their 9-year-old daughter. 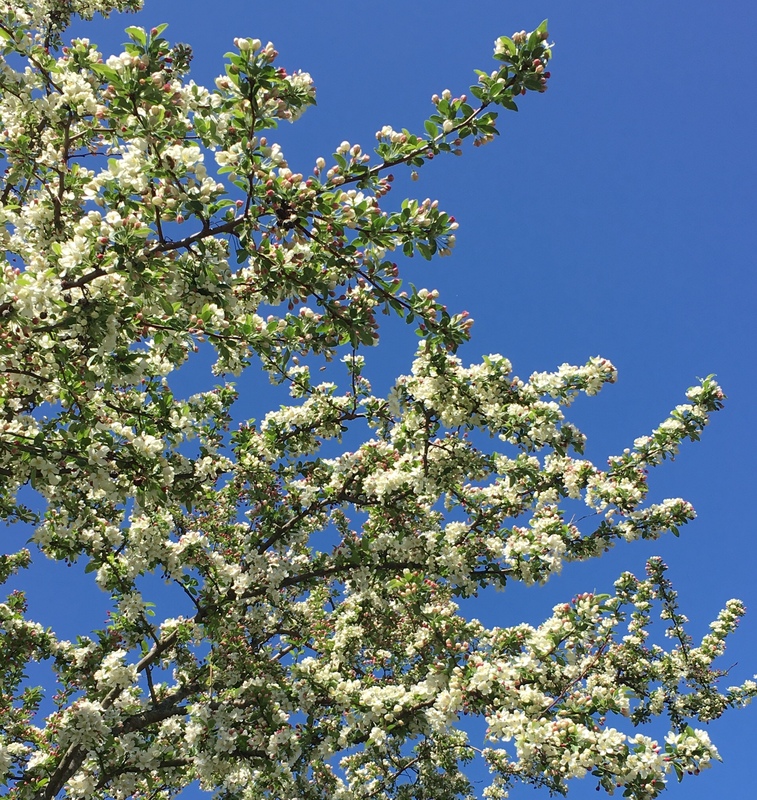 We all stood outside in front of the newly planted tree, blessing the scene, blessing each other, blessing the sunshine and the two boys who acted horrified and delighted by the newly dug out grubs that slithered and squirmed in the wheelbarrow. I stop my thoughts and return to the here – my computer desk covered with scattered pages: the Table of Contents of my unfinished novel, the small papers of quotes that I save for just the right occasion, the purple paperweight that my son gave me eons ago. The morning sun glows through the round glass weight that is holding down my thoughts, stopping the breeze from scattering them all over. Thanks, David. May we always recognize and applaud the wonder of the ordinary. music has that power to bring us whenever we want, because she awakens emotions in us.Interestingly, our brain remembers emotions ,and a certain song always bring us the same emotions. I just taught a writing class about the importance of music in our writing and our creativity. A few notes ring out, and wham, the listener can be filled with emotion: sad, joyful, a memory forgotten, pain, but mostly, pleasure. A lovely glimpse into your family’s life. Music is indeed an evocative force here on planet earth. Hurrah for Delilah the Dogwood! And fish tacos! and trumpet dedications! And lava cakes! And loving sons-in-law! I have recently re-discovered the music of the Carpenters… Karen’s voice is so heartful and soothing (and for me there is the added poignance of the personal demons she was wrestling with for much of her career). I use music every day to motivate and organize my thoughts and actions. Lovely to learn that many people accompany their writing with music! I agree about Karen Carpenter and her voice. It’s absolutely angelic and takes me to a different place when I listen to her songs. Funny, many people have discounted the Carpenters’ music as either being too ‘sweet’ or too ‘old.’ They’re missing out. I love finding out here how many writers listen to the musical notes of others as they create their own writing notes. Some of her songs are so haunting. They help me to dig deep when writing an emotional scene. Nice to meet you! Music is miraculous that way. I wish you a beautiful melody today, and all weekend long. You stopped me at “Sons-in-law have it tough.” I’d never looked at my two sons from that perspective, one deserving of attention. And so I’m off, to my girl cave upstairs, to write, to attend. In your honor I’ll try Spotify once again. Thank you, Pam. Ah, interesting, Janet. Yes, sons-in-law AND daughters-in-law can have a tough job — to love our children as deeply as we do. Hope Spotify found you just the right music to inspire you and your writing. Such a beautiful post, Pam. It sounds like you had a truly lovely mother’s day with your family. My son-in-law is wonderful, and I think my husband is enjoying having a son. 🙂 He listens to classical music while he studies. My other daughter has a wife, so we have a daughter-in-law, too, and she is also wonderful. I love music, but I can’t listen to music while I write. I think if we love our children, we need to love their spouses. It’s only right. Oh my gosh, I’m just now listening to a piano solo that brings tears to my eyes. Poetic. I’m fascinated that you don’t/can’t listen to music as you write. Perhaps because when you’re creating poetry, you don’t want to be influenced by the strands of poetic music. So lovely!! I say he sounds like a very special son-in-law! I love Dogwoods and love that your daughter named it and a trumpet dedication. So magical! Beautifully said! Love that tree! Oh! You’re sooooo right, Darlene. Thanks for the laugh, wink wink. Sounds like it was a perfect day. That son-in-law is a keeper. You can surely do worse son-in-law-wise, that for sure. And you know what? Every new tree should be similarly named and serenaded. Yes, Anneli, I think you’re right. Your mother-in-law sounds like an amazing woman – and a lucky one, to have you for her daughter-in-law. Thanks for a warm and wonderful share . . . overflowing with concordant notes. All people who marry our progeny have it tough—no one is ever good enough! But your son-in-law comes pretty close! I like the paperweight, and the quote by Michener. Great post! What a lovely story. I keep telling my daughter a mate who respects and cherishes her is what she wants. It sounds like your daughter found that. I’ve taken to listening to a bit of background music while writing. Maybe I’ll include that Dvorak, Pam, though classical is not at all my ‘thing’. Interesting, Roy. I’d guess you for a good classical listener – not during your running, of course, but for after, when you’re contemplating the joy of stopping. I wonder what background music you listen to as you write? Right now I’m listening to a piano solo – Hope Endures – by Philip Wesley, which seems to soothe the soul and encourage the fingers to move. Haha I was just thinking about how interesting it is after raising 3 boys, to find that I am now a mother in law. Having no experience being a mom to girls, it is all a new learning experience for sure! I say your son in law gets a medal for such an all round “performance” for mother’s day. Wow. Impressive. No doubt though he is super lucky to have you as a mother in law. My kind of music. Just what I used to like to paint to. Puts the brain in that meditative zone for creativity. Yes, Peta, that’s it. Contemplative classical music can relax our brain into that creative zone. You expressed it exactly. What a lovely day you described. You all made a beautiful memory to flashback to when you’re trying to write. LOL Happens to me all the time. I listen to classical when I write, too. Hope you have another lovely weekend, Miss Pam. You are truly blessed Pam…in this world of complex and demanding relationships, you seem to live at an oasis of love and respect. Stay blessed! Thanks for sharing a heart-warming story of real life. Pam, your whole post excudes love and happiness – so much warmth. Are you getting just a bit spoiled there? :) with such an attentive and capable son in law. grin. With family gatherings like these there is little else to wish for. A quiet, joyful and peaceful post. You have a lovely family! And I enjoyed listening to Dvorak’s beautiful Bagatelle #5 Op.47. I listen to music as I read posts, but find it harder when trying to write. What a wonderful post! I love music but have to admit that I don’t listen to it very often on my own. Even on my walks, if I listen to anything, it’s usually a podcast. Your son-in-law is a gem! Thanks for commenting here. I find it peaceful to have classical music in my background at home. But when I walk I want to listen to natural musical sounds (birds, trees humming with the breeze, my own scattered thoughts). I haven’t become a pod cast listener yet; good to know that you enjoy doing that. Awww, thank Gerlinde. I wonder if you have a special musician you most enjoy. WOW! Thank you, Sally. And I must tell you, I’ve just (finally!) finished your book of short stories – What’s in a Name? SO MUCH in each of your storied names. Totally impressed. Review going up on Amazon soon. 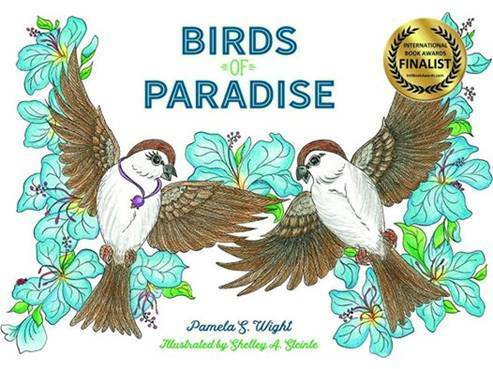 It’s lovely to be transported, by music – and by your words Pam. Your son in law sounds like a gem and I enjoyed sharing those experiences with you. I have two boys, Pam, so I am glad to read this post. Your son-in-law sounds like a gem. He was surely thoughtful to plant a beautiful dogwood for your daughter. And a musical salute to the tree- unheard of in my neck of the woods. I bet the dogwood will flourish with grace and beauty and be the center of many conversations to come. I am so sorry for being so late sending a comment! This was a fantastic post! I have to say, music is my savior from all the insanity in the world. I have my earbuds in all day at work and it helps. To me, music is very magical and even inspiring! Thank you for this amazing post! I think I would be lost without music!!! There is NO way I could make it through a day at work without music! When I was finishing college I would listen to classical when I was studying and it helped me focus! It sounds like the perfect family weekend Pam…and that lava cake…sounds so yummy. There is truly nothing better than family time.. Enjoy the week ahead. I’m finally working on catching up. This is wonderful…what a beautiful picture of your weekend, and your experience of thinking and writing about it. Thank you! 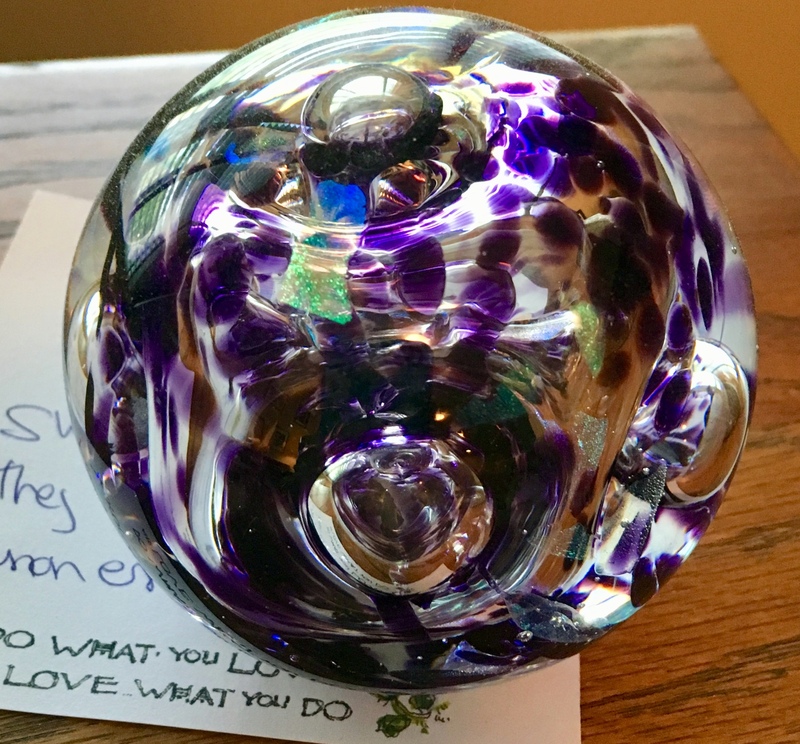 The beautiful blown glass paperweight was a wonderful, thoughtful gift from your son. The pink dogwood was a lovely gift for your daughter. Then, homemade lava cakes. . . I may swoon over the vision and wafting chocolate heaven you mentioned! Oh, I was a nerd and played in three bands, marching, orchestra and symphonic. . . Somewhere in my fingers are the notes to some amazing music. I was always second row clarinet, first seat. Ha ha! The director always emphasized​ the time in history and how to pronounce the Masters’ names. This is beautiful, Pam. The time spent with your family sounds extraordinary. You are absolutely blessed! Hugs. Oh my gosh, Kate. 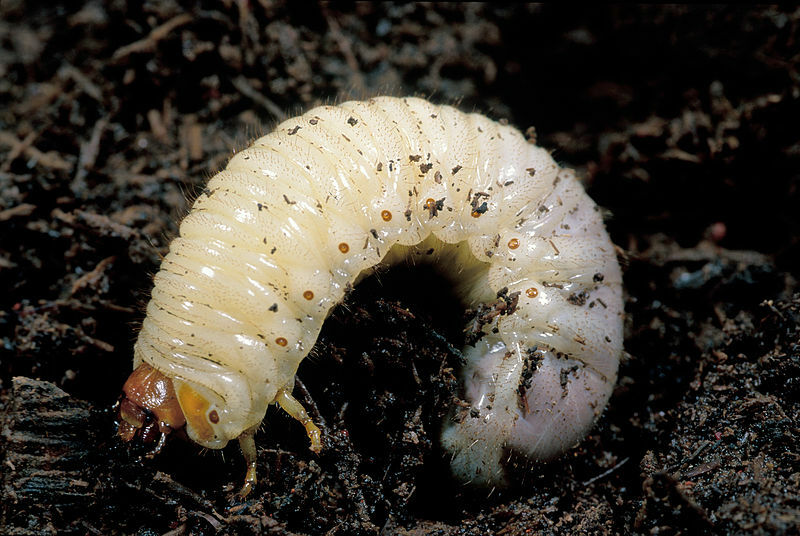 This is …. amazing. I literally just hit the send button because I just read your latest post, and at that second, your comment to me here came in. HOW INCREDIBLE IS THAT? To the sounds of nature, the messages from birds, and to our messages to each other. Here and there, the lens of our perception shifting back and forth. I felt right “there” with you in the “here” while reading your post! Pam, Found this today and thought of you….. Still the music plays as I write and hope you enjoyed all the bounties of Cake, Flowers, Trumpets, and Family.. Many thanks for joining me on my muse. I’m glad that the music continued to play for you! 🎶Music and muse are a great combination. A lovely scene! I have the music playing in the background as I write my comment. It’s wonderful! Might have to find that station also. Don’t even ask me why it took me so long to get back to your comment made in… May 24! Well, could be because that was the day my guy and I were rear-ended and I got a concussion. I’m slowly, slowly coming back to “normal.” I’d love to know what blogger you met in AZ. Wonder if I read her blogs too? Hey Pamela.. I am so sorry about your accident. I’m glad you are on the mend. Been through my own trauma lately so blogs and comments have taken a back burner. Hence the reason you haven’t heard feom me lately. I’d say that’s some son-in-law, one to be grateful for. And I love the trumpet welcome to Delilah. But mostly I love the meandering process you describe about writing, listening to music, and how wonderful it is to just let ourselves happily drift. I’m slow in my thanks here for your beautiful compliment on writing. Yes, I think writing about the “ordinary” should be beautifully meandering, with words that still entice the reader to hang on to each one.